If you can’t decide which country shows to attend in 2018, we’ve got you covered! 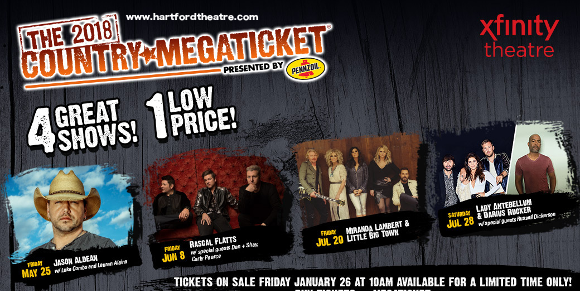 The Country Megaticket Tickets are back, giving you a pass to ALL performances at the comes to Xfinity Theatre, kicking off on Thursday 24th May 201 with a performance by Jason Aldean, followed by shows by Rascal Flatts, Miranda Lambert and Little Big Town, and finally, Lady Antebellum with Darius Rucker!! It’s more than any country fan could ever want, at an incredible value price!! Country Megatickets sell out every year, so don’t delay – get your tickets TODAY!! Jason Aldean is on tour with his latest album, 2016’s “They Don’t Know”. Rascal Flatts will be performing all the hits from their latest album, “Back To Us”. Miranda Lambert and Little Big Town both have recent new releases to perform for us, Miranda Lambert’s “The Weight Of These Wings,” and “The Breaker,” by Little Big Town. As for Lady Antebellum and Darius Rucker, these incredible closing acts aren’t just co-headlining – they’ll be sharing the stage for the first time EVER for some very special songs during the show!! This truly colossal line-up promises you a glorious supply of live country hits from your favorite artists for an entire month!! Well, what are you waiting for?? Get your tickets NOW while you still have the chance! !